What I liked the most about the services at Peacock Bridge Kennels was the end results of the training. We were so impressed how disciplined, obedient, calm and happy Bailey was when she returned home. All of her issues (jumping up, emptying waste cans, pulling on the leash when attempting to walk with her and only obeying commands when she felt like it) were all addressed and the results were amazing! I appreciated everything about your service, from the friendly, reliable staff to the excellent care of my dog! Whenever I called, the staff eagerly addressed my concerns regarding discipline issues, special feeding and grooming. 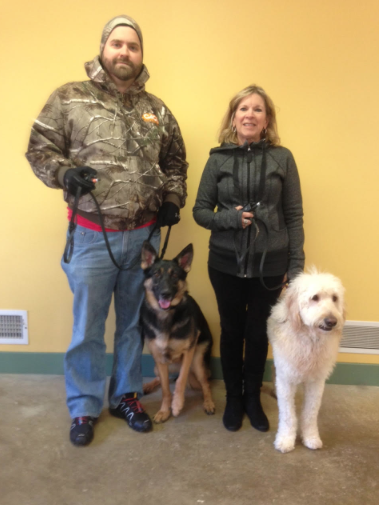 Andy and his staff truly care about their clients and their pet’s care and training! Dropping Bailey off was a bit hectic because of all the other dogs being admitted for training on that day, but I’m sure that simply reflects the popularity of your training facility. Bailey and I are still struggling with her stealing socks after everyone goes to bed in the evening and the collar comes off, but I’m sure with repetition of discipline, we will correct this. She knows that she shouldn’t do it, but I can’t seem to “catch” her in the act. Over-all I am so very pleased and satisfied with Peacock Bridge Kennels and HIGHLY RECOMMEND THEM!